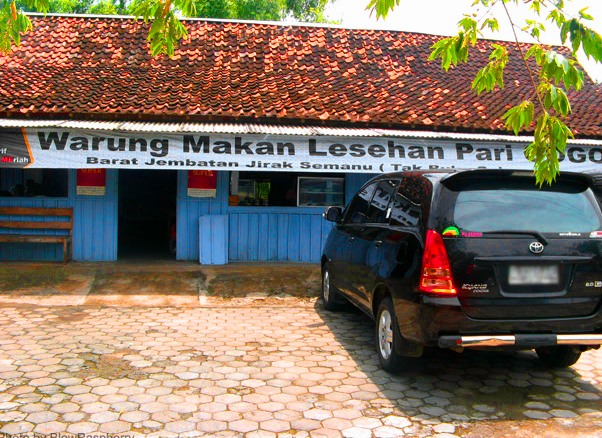 IndonesiaTravelVisit.com | Lesehan Pari Gogo is a legend; even Sultan HB X and Megawati had enjoyed being there. The top menu is the peculiar culinary of dry land, such as sego abang (brown rice) and other unique culinary. Wanna try? We were amazed by the view of Gunungkidul's challenging nature, its coral hills, farms, and the grasshopper sellers along the way. The trip, which was about to take us to explore the charming beaches, clearly showed how Gunungkidul's local fellows live their life in synergy with the surrounding nature. We stopped by at Sego Abang Mbah Jirak, a legendary restaurant renowned more by the tourists rather than by the local people. While waiting for the orders to come, we took some times to take a glance to the whole room. On the walls made of gedhek (bamboo pleats) and woods, there are several photographs of renowned figures from the ex-president Megawati to Sultan Hamengku Buwono X. The photographs showed them cheerfully enjoying sego abang (brown rice). 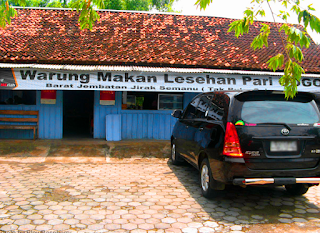 Our orders were served to us, who waited while sitting on lincak (traditional long bench made of bamboo); it was something new for us as we used to know lesehan as sitting directly on the floor, without seats/chairs. The complete menu that got our appetite rising consisted of: brown rice, empal (fried cow meat), fried chicken intestines, fried chicken, fried wader (small plain water fish), green chili soup, and trancam (a kind of salad made of fresh uncooked vegetables with coconut shreds topping). The rice was delicate and crispy, unlike ones we used to eat. The delicious dishes, combined with the hot, spicy green chili soup and the fresh trancam, offered a pleasing culinary taste. After having some talks with Mr. Purwanto, we started to understand the secret recipe behind the tasty brown rice. The luscious taste came from the traditional processes, starting from the harvesting of the rice-plants to the cooking. The rice was produced from gogo rice-plants, which grows well in such a challenging area as Gunungkidul. Behind the pleasing rural atmosphere, there lies another culinary option which would tempt any tourists the fried grasshoppers. The insects are commonly found on teak woods and bushes growing around Gunungkidul. According to a humble man sitting next to us, fried grasshoppers taste like shrimps, but with higher protein. Still, none of us dared enough to try it. Perhaps it sounded somewhat weird to us, but consuming grasshoppers is mentioned in the Bible. Before Christ, John Baptist survived living solely in the desert by eating grasshoppers. The culinary is also popular in various cultures throughout the world, among others are Chapulines in Mexico, Inago in Japan, Tak Ga Tan in Thaiand, and many more. We hadn't had enough time as we had to continue the trip, so we had to go on. The waiter came and calculated the prices. The menu were safe enough for our budget. One single plate of dish and vegetable is enough to serve 4-5 persons. 0 Komentar untuk "LESEHAN PARI GOGO Red Rice and Culinary from The Dry Land"